The pituitary gland is a small, oval-shaped endocrine gland about the size of a pea located in the center of the brain above the back of the nose. Its major role is to produce hormones that regulate growth and metabolism in the body. Removing this important gland is a drastic step that is usually taken in the case of cancers or tumors that resist other forms of treatment, especially craniopharyngioma tumors. Hypophysectomy may also be performed to treat Cushing's syndrome, a hormonal disorder caused by prolonged exposure of the body's tissues to high levels of the hormone cortisol, in most cases associated with benign tumors called pituitary adenomas. The goal of the surgery is to remove the tumor and try to partially preserve the gland. Craniopharyngiomas account for less than 5% of all brain tumors. Half of all craniopharyngiomas occur in children, with symptoms most often appearing between the ages of five and ten. Cushing's syndrome is relatively rare in the United States, most commonly affecting adults aged 20–50. An estimated 10–15 of every million people are affected each year. However, the Pituitary Network Association reports that one out of every five people worldwide has a pituitary tumor. The earliest study was performed in 1936, by Dr. R. T. Costello of the Mayo Foundation who found pituitary tumors in 22.4% of his studied population with statistics not having changed significantly since that time. There are several surgical approaches to the pituitary. The surgeon chooses the best one for the specific procedure. The pituitary lies directly behind the nose, and access through the nose or the sinuses is often the best approach. A craniotomy (opening the skull) and lifting the frontal lobe of the brain will expose the delicate neck of the pituitary gland. This approach works best if tumors have extended above the pituitary fossa (the cavity in which the gland lies). Surgical methods using new technology have made other approaches possible. Stereotaxis is a three-dimensional aiming technique using x rays or scans for guidance. Instruments can be placed in the brain with pinpoint accuracy through tiny holes in the skull. These instruments can then manipulate brain tissue, either to destroy it or remove it. Stereotaxis is also used to direct radiation with similar precision using a gamma knife. Access to some brain lesions can be gained through the blood vessels using tiny tubes and wires guided by x rays. A patient best prepares for a hypophysectomy by keeping as healthy and relaxed as possible. Informed surgical consent is always required. The patient is first seen for evaluation of pituitary functions by the treatment team. An MRI scan of the pituitary gland is performed and the patient is seen by a neurosurgeon in an outpatient clinic or at the hospital to assess whether hypophysectomy is suitable. The patient checks into the hospital the day before surgery and undergoes blood tests, chest x rays, or an electrocardiogram to assess anesthesia fitness. Four to five sticks are attached on buttons on the forehead and marked for a special MRI scan. These buttons and scan help the neurosurgeon to accurately remove the pituitary tumor using sophisticated visualization computers. The patient is visited by the anesthesiologist (the physician who puts the patient to sleep for the operation) and he is asked to fast (nothing to eat or drink) from midnight before the day of surgery. 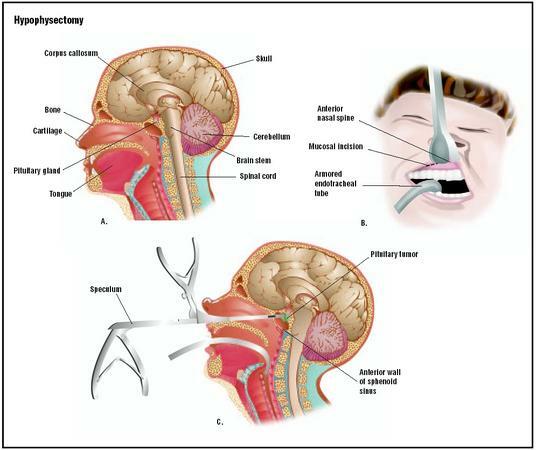 If the hypophysectomy is performed through the nose, the patient is advised to practice breathing through the mouth as the nose will be packed after the surgery. The patient's nose is packed to stop bleeding. There may be a dressing on a site of incision in the abdominal wall or thigh if a graft was necessary. A drip is attached to the hand and foot and other lines are attached to monitor the heart and breathing. A urinary catheter is placed to monitor fluid output. The patient has an oxygen mask. Once in the ward, the patient is allowed to eat and drink the same night, after he or she has recovered from the anesthesia. If fluid intake and output are in balance, the drip and urinary catheter are removed the next morning. The nurses continue to monitor the amount of fluid taken and the amount of urine passed by the patient for a few days. The blood is usually tested the day following surgery. The nasal pack stays for about four days. Once the nasal pack is removed, patients commonly experience moisture coming through the nose and bloodstained mucus occurs frequently. If all is well, patients are usually discharged the following day. There are no sutures to be removed. The sutures in the nose are degradable and the graft site is usually glued together. Patients are advised not to blow their nose or insert anything in the nose. The risks associated with hypophysectomy are numerous. Procedures are painstakingly selected to minimize risk and maximize benefit. A special risk associated with surgery on the pituitary is the risk of destroying the entire gland and leaving the entire endocrine system without regulation. Historically, this was the purpose of hypophysectomy, when the procedure was performed to suppress hormone production. After the procedure, the endocrinologist, a physician specializing in the study and care of the endocrine system, would provide the patient with all the hormones needed. Patients with no pituitary function did and still do quite well because of the available hormone replacements. Hypopituitarism. Following surgery, if the pituitary gland has normal activity, it may become underactive and the patient may require hormone replacement therapy. Diabetes insipidus (DI) (excessive thirst and excessive urine) is not uncommon in the first few days following surgery. The vast majority of cases clear but a small number of individuals need hormone replacement. Cerebrospinal fluid (CSF) leakage. CSF leakage from the nose can occur following hypophysectomy. If it happens during surgery, the surgeon will repair the leak immediately. If it occurs after the nasal pack is removed, it may require diversion of the CSF away from the site of surgery or repair. Infection. Infection of the pituitary gland is a serious risk as it may result in abscess formation or meningitis. The risk is very small and the vast majority of cases are treatable by antibiotics . Patients are usually given antibiotics during surgery and until the nasal pack is removed. Bleeding. Nasal bleeding or bleeding in the cavity of the tumor after removal may occur. If the latter occurs it may lead to deterioration of vision as the visual nerves are very close to the pituitary region. Nasal septal perforation. This may also occur during surgery, although it is very uncommon. Visual impairment. A very rare occurrence, but still a risk. Incomplete tumor removal . Tumors may not be completely removed, due to their attachment to vital structures. In the past, complete removal of the pituitary was the goal for cancer treatment. Nowadays, removal of tumors with preservation of the gland is the goal of the surgery. A follow-up study performed at the Massachusetts General Hospital and involving 349 patients who underwent surgery for pituitary adenomas between 1978 and 1985 documented 39 deaths over the 13 year follow-up. The primary cause of death was cardiovascular (27.5%) followed by non-pituitary cancer (20%) and pituitary-related deaths (20%). When compared to the population at large, the primary cause of death was also cardiovascular (40%), followed by cancers (at 24%). Surgery is a common treatment for pituitary tumors. For patients in whom hypophysectomy has failed or who are not suitable candidates for surgery, radiotherapy is another possible treatment. Radiation therapy uses high-energy x rays to kill cancer cells and shrink tumors. Radiation to the pituitary gland is given over a six-week period, with improvement occurring in 40–50% of adults and up to 80% of children. It may take several months or years before patients feel better from radiation treatment alone. However, the combination of radiation and the drug mitotane (Lysodren) has been shown to help speed recovery. Mitotane suppresses cortisol production and lowers plasma and urine hormone levels. Treatment with mitotane alone can be successful in 30–40% of patients. Other drugs used alone or in combination to control the production of excess cortisol are aminoglutethimide, metyrapone, trilostane, and ketoconazole. Biller, Beverly M. K. and Gilbert H. Daniels. "Neuroendocrine Regulation and Diseases of the Anterior Pituitary and Hypothalamus." In Harrison's Principles of Internal Medicine, edited by Anthony S. Fauci, et al. New York: McGraw-Hill, 1997. Jameson, J. Larry. "Anterior Pituitary." In Cecil Textbook of Medicine, edited by J. Claude Bennett and Fred Plum. Philadelphia: W. B. Saunders, 1996. Youmans, Julian R. "Hypophysectomy." In Neurological Surgery. Philadelphia: W. B. Saunders, 1990. Buchinsky, F. J., T. A. Gennarelli, S. E. Strome, D. G. Deschler, and R. E. Hayden. "Sphenoid Sinus Mucocele: A Rare Complication of Transsphenoidal Hypophysectomy." Ear Nose Throat Journal 80 (December 2001): 886–888. Davis, K. T., I. McDuffie, L. A. Mawhinney, and S. A. Murray. "Hypophysectomy Results in a Loss of Connexin Gap Junction Protein from the Adrenal Cortex." Endocrine Research 26 (November 2000): 561–570. Dizon, M. N. and D. L. Vesely. "Gonadotropin-secreting Pituitary Tumor Associated with Hypersecretion of Testosterone and Hypogonadism After Hypophysectomy." Endocrinology Practice 3 (May-June 2002): 225–231. Nakagawa, T., M. Asada, T. Takashima, and K. Tomiyama. "Sellar Reconstruction After Endoscopic Transnasal Hypophysectomy." Laryngoscope 11 (November 2001): 2077–2081. Volz, J., U. Heinrich, and S. Volz-Koster. "Conception and Spontaneous Delivery After Total Hypophysectomy." Fertility and Sterility 77 (March 2002): 624–625. American Association of Clinical Endocrinologists (AACE). 1000 Riverside Ave., Suite 205, Jacksonville, FL 32204. (904) 353-7878. http://www.aace.com/ . American Association of Endocrine Surgeons (AAES). Metro-Health Medical Center, H920, 2500 MetroHealth Drive, Cleveland, OH 44109-1908. (216) 778-4753. <http://www.endocrinesurgeons.org/gt; . Hypophysectomies are performed by neurosurgeons or surgeons specialized in endocrinology. Endocrinologists are physicians with special education, training, and interest in the practice of clinical endocrinology. These physicians devote a significant part of their career to the evaluation and management of patients with endocrine disease. These physicians are usually members of the American Association of Clinical Endocrinologists and a majority are certified by Boards recognized by the American Board of Medical Specialties. A hypophysectomy is major surgery and is always performed in a hospital setting. Should I stop any medications before surgery? How long will it be before I can resume normal activities? How many hypophysectomies do you perform each year? Thank you so much for this article. I am a healthcare worker and my husband was diagnosed with a tumor of the pituitary gland. He was experiencing symptoms of a TIA when he was taken to the hospital. After testing and a neuro consult we were told he needed sugery, and he was sent home. He has experienced loss of sight and major mood swings. After finding your website I can breathe a sigh of relief because you have information that the sugeron did not give to me. Again, "Thank you so much." My mom who is a 68 year old lady has been suffering from pain in the right half of the head for last fifteen days. MRI scan revealed soft tissue mass lesion in right aspect of the sella - probably arisng from the right half of anterior pituitary gland (~1.58*1.33*1.26cm) with right cavernous sinus extension showing isointense signal intensity to the brain parenchyma on T1 weighted images and mild hyperintense signal intensity on T2 weighted image which on post gad study shows mild inhomogenous enhancement pattern. I am an overseas patient from Ghana-West Africa suffering from puituitary adenoma,which is making me blind in the left eye. I have been on the wating list for surgery for about 2 years now with no hope in view cos all the country's hospitals dont have the machine florescopy to perform the surgery.I would be grateful if someone could help me with the names of hospitals who perform such surgeries and additionally how much it will cost in both private and NHS hospitals. Also get me in touch with any charity organizations that offer medical help or medical equipment for developing countries to assess for their country cos there are a lot of peopple ahead of me. Thank you and God bless you. A nice article indeed! How does antibiotic therapy works after hypophysectomy despite the brain-blood barrier in place? What could be the possible cause if polymorphonuclear cells exist in the CSF after the surgery although infection is not confirmed after the CSF is cultured in the lab. Is there any complication in managing the volume of CSF after the surgery? Kindly explain. Thanks again for generating interest in this area of surgery!